Regression, propensity score (PS) and double-robust (DR) methods can reduce selection bias when estimating average treatment effects (ATEs). Economic evaluations of health care interventions exemplify complex data structures, in that the covariate–endpoint relationships tend to be highly non-linear, with highly skewed cost and health outcome endpoints. When either the regression or PS model is correct, DR methods can provide unbiased, efficient estimates of ATEs, but generally the specification of both models is unknown. Regression-adjusted matching can also protect against bias from model misspecification, but has not been compared to DR methods. 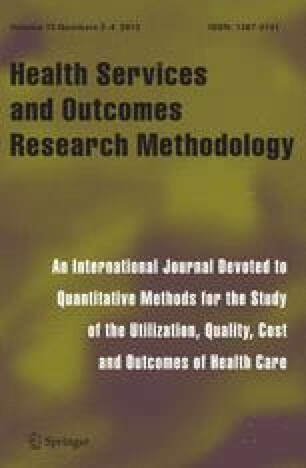 This paper compares regression-adjusted matching to selected DR methods (weighted regression and augmented inverse probability of treatment weighting) as well as to regression and PS methods for addressing selection bias in cost-effectiveness analyses (CEA). We contrast the methods in a CEA of a pharmaceutical intervention, where there are extreme estimated PSs, hence unstable inverse probability of treatment (IPT) weights. The case study motivates a simulation which considers settings with functional form misspecification in the PS and endpoint regression models (e.g. cost model with log instead of identity link), stable and unstable PS weights. We find that in the realistic setting of unstable IPT weights and misspecifications to the PS and regression models, regression-adjusted matching reports less bias than DR methods. We conclude that regression-adjusted matching is a relatively robust method for estimating ATEs in applications with complex data structures exemplified by CEA. We thank Zia Sadique (LSHTM) for help in the motivating case study, Roland Ramsahai (University of Cambridge) for valuable comments on the Monte Carlo simulations, Manuel Gomes, Karla Diaz-Ordaz, Adam Steventon, Rhian Daniel (all LSHTM) and Susan Gruber (Harvard School of Public Health) for comments on the manuscript. We also thank David Harrison and Kathy Rowan (ICNARC) for access to the data used in the case study. Funding from the Economic and Social Research Council (Grant no. RES-061-25-0343) is greatly appreciated. 1: Stable IPT weights, “mild” misspec. 2: Stable IPT weights, “major” misspec. 3: Unstable IPT weights, “major” misspec. 3 and 4: Unstable IPT weights, “major” misspec.